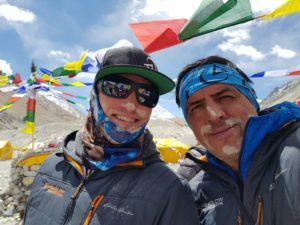 A successful Everest journey begins with Puja. 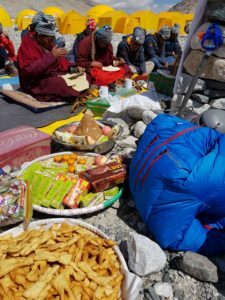 Before leaving Everest Base Camp and beginning their arduous journey to its summit, Climbers and Sherpa take part in the Puja ceremony. 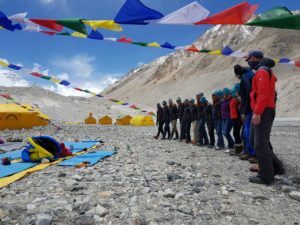 A literal “right of passage”, the Puja ceremony is performed to make contact with divine Sagamartha, Mount Everest, and pray for a safe expedition. In preparation for the ceremony, a large cairn is constructed with long strands of prayer flags. 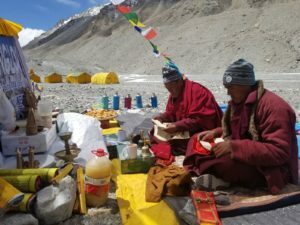 The team makes an offering of special foods and drinks and brings their climbing gear to be blessed for the journey. Tsampa flour, a staple of the Tibetan diet, is spread on the faces of climbers and Sherpa. At the end of the ceremony, it is tossed in the air in celebration and for good luck. The Puja is a moving experience for anyone who has had the opportunity to be part of one.